That’s us! I’m Kim and he’s Todd – an elementary school teacher and a computer software engineer from Portland, Oregon. Four years ago we ventured into the Airstream world when we purchased a new 16 foot Airstream Bambi. We were total camping newbies and had never pulled a trailer before. We had no idea what fun and adventures we’d have. Our goal was to take the Bambi out at least once a month…and for the most part we made it! 75 trips later we traded it in for a 2015 25fb. Good luck to you, Lynn…it’s a fun decision 🙂 Lucky for us Oregonians we have two dealerships locally to check them out! I hope you’ll update me when you find one and send me a link if you post photos! Hi Linda, Congratulations on your retirement!! I have seven more years to go…I start back to school this Monday, but I still love it, even after all of these years. Always sad to see summer come to an end, but there’s something exciting about the starting of a new school year! Now to answer your question about the 16′ vs 19′ and if we ever wished we had a larger one….the answer is yes, sometimes. That said, we love our little 16′ and we still feel like it was the right choice for us this time in our lives. The PNW is so dark and gray most of the year, that the wrap around windows at both ends was a must have for us. It’s also small enough to fit nicely on our driveway, and we can sneak it into just about any camp site! We really only use ours on the weekends though, usually just 2-3 nights at a time. If you’re really planning on traveling, the larger ones offer some real benefits. We have only a combined gray/black tank and it’s rather small…the 19′ has separate tanks and they hold a lot more. Ours only has one battery (we’re adding a second), the 19′ has two. Ours does not have a heat pump, the 19′ does. Ours has a wet bath, the 19′ has a separate shower and vanity. The 19′ also has larger propane tanks…and of course, there is more storage. The 16′ actually has a longer bed which was also important to us because my husband is 6’3. Best of luck to you, and I hope you drop me a note when you get one! Are you guys going to go? I picked a quiet site, might be fun to have you near or next to us. Would love to hear from you. I just discovered your blog, as another Portland mother that loves a good road trip, I love it! Thanks for sharing your travels and beautiful photographs! Great blog! I love the Bambi!! This is a very well done and inspiring site. Hopefully I will get out and do some camping myself. There is so much to see and the only way to really see it is in person. Yeah, I’m a teacher as well. I want my kids to experience nature and am thinking of buying a small airstream. What type of vehicle do you use to tow your airstream? Is there a ratio of weight between the car and airstream? Beautiful, beautiful pictures! Stumbled upon your blog while researching the 16’s, as we are looking to buy one soon. Love the way you’ve decorated your bambi – so adorable. When you were purchasing yours, did you look into buying used or only new? Amy, there weren’t any small ones when we were looking so we did get it new. If I were buying a larger one, I would probably look for a used one. There seem to be a lot more of them on the market! Was just sharing your closet organizing post with someone on Air Forums and thought I would revisit your great blog. Did you pack away the AS for the winter after August or does the start of school put camping on the back burner. I’m married to a retired teacher, so I know all about the start of the school year. I am the owner of http://www.easiercamping.com and I like your website. I also have a website that offers great information on “camping”. If you would like to exchange links, I would be happy to do so. Your Bambi is sweet! Your photos are beautiful. I’ll have to put some of those campgrounds on my wish list! I don’t see any recent posts from you guys though. What’s up, and when will you be out and about again? My poor blog has been ignored too long 🙂 We’re back on the road and ready for more adventures! Well that’s good to hear! Now that a couple of us have bugged you, maybe that’ll get you going again! Do you still have your photos on smugmug? I can’t find them. I have just been referred to your blog from someone over at Airforums. My wife and I live in Portland and just took delivery of our 25ft Flying Cloud. We love, love, love your blog! Thank you for your work! 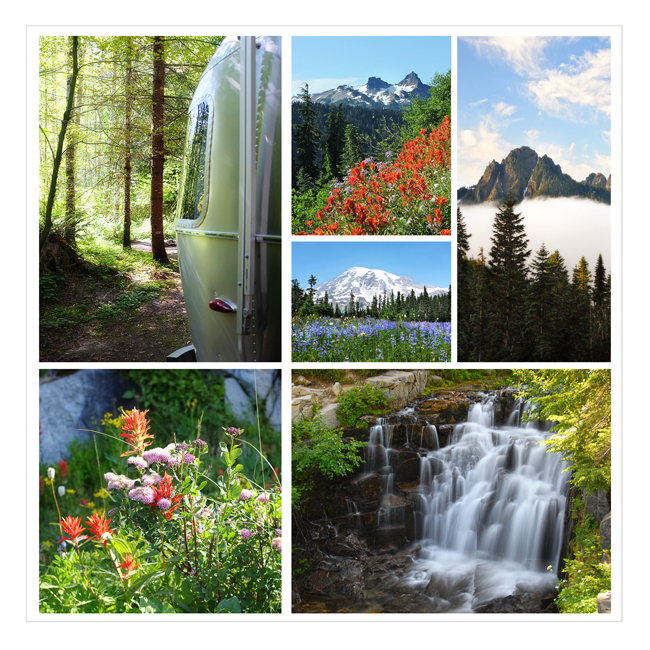 Being from the Northwest, we are always looking for new camping experiences to explore. We have a small 17′ Nash all weather trailer which is a size that allows us to camp in the smaller US Forest Service and County Campgrounds we love. We do camp in the State Parks off season and find them enjoyable as well. We have a goal to camp at least one weekend a month, with three longer trips. Loved using your blog to assist with campsite and hiking location selections. Thank you so much! I’ve been talking about visiting the gorge to see the wildflowers in the spring for years. Your blog made the planning easy and I’m so looking forward to this trip! Also love the bright colored, creative accessories and storage solutions you have used and shared. One of your interior photos shows a small black rectangular table next to the couch of your new trailer. Can you tell me where you purchase it? Would be perfect size and shape for our trailer. Thanks again for the very special blog. Look forward to your future posts! Why is the heat pump an advantage? Kim & Todd, what a great blog. Enjoy the fact that you do a lot of 2-3 day trips. Can’t wait to start doing this ourselves in the next 12-24 months. We are seriously considering the 23FB, but after reading your blog, possibly start out with a Bambi 16. Todd is a big guy and it seems he handles the Bambi well for 2-3 day trips. I’m a cancer survivor and delighted you are doing so well. Our daughter was an IB graduate as well. Wonderful program. Keep up that wonderful photography. Your photos are beautiful and your blog isson well done. Hi Kim – thank you so much for your entertaining and informational blog. I retired a year ago from managing west side recreation on Mt. Hood including McNeil, Camp Creek, Bagby, Olallie, etc! So it is nice to see you all enjoy it. We scored a 2014 Alto R1723 (http://www.safaricondo.com/en/caravanes_R1723) trailer that is 17/5 feet long. It is a tear drop with a roof that raises with lots of windows and amenities. We have been to Stub Stewart, Tillicum, Honeyman SP, and are headed (thanks to your pics!) to Blue Bay next week! My brother and sister in law just bought a 16 ft 2017 Bambi near Sun Valley, ID. So we look forward to camping with them. Your new trailer looks gorgeous. How did you all handle sleeping in the Bambi? I am not huge, but 48″ wide bed leaves me 24″ assuming by better half isn’t hogging (he usually does). I assume the new queen is a big improvement. The Alto has a king size which spoils me. Hope to see you all around one of these days! Thanks again for the feedback and camping tips! Hi Kim we came across your blog after searching for a Bambi 16 International. Love your story and images. We trying to find a used Bambi 16 anywhere on the west coast for sale but not having much luck. Airstream changed the Bambi 16 to a sport model which only has a single rear window now. Nowhere near as cool as your old 2012 model. If you or anyone else who knows of one for sale we would be very interested. Thanks. Hi Kim and Todd – My wife and I have owned a Bambi Sport 16 for 3 years. I’m looking at the 25 Twin for our next Airstream. Twin because like Todd I’m 6′ 3″. I too want to get an F150. Is your ecoboost the 3.5L or 2.7L? Thanks. Love your photography and trailer decor. Hi. I think we stayed next to you at Memaloose a couple of weekends ago. What a beautiful Airstream! I came across your site while looking for camping photos on Mt. Hood. I work for Oregon’s Mt. Hood Territory which is the Destination Marketing Organization for Clackamas County. I’d to talk to you about using one of your camping photos in some of our publications. Could you please email me at casey@mthoodterritory.com and we can chat? Thank you and I look forward to speaking with you soon! We just received our 2017 Oregon State Parks Guide and see that your 16ft. Bambi is featured in the guide. Woo-hoo! I know a celebrity now! Gives me tingles! You do deserve credit (which isn’t given) for your fine photography skills. Your photos are very inspiring. In fact, after getting our guide, we looked up a place to go and are on our way to Honeyman St. Park this weekend to celebrate our 39th anniversary….yikes! are we that old? I’m planning on purchasing a 25FB and pick up truck in the next month. Does your F150 do the job on mountain roads? If there are any tips you can give me it would be greatly appreciated! Hi there, Love all the photos and ventures you both have been on. 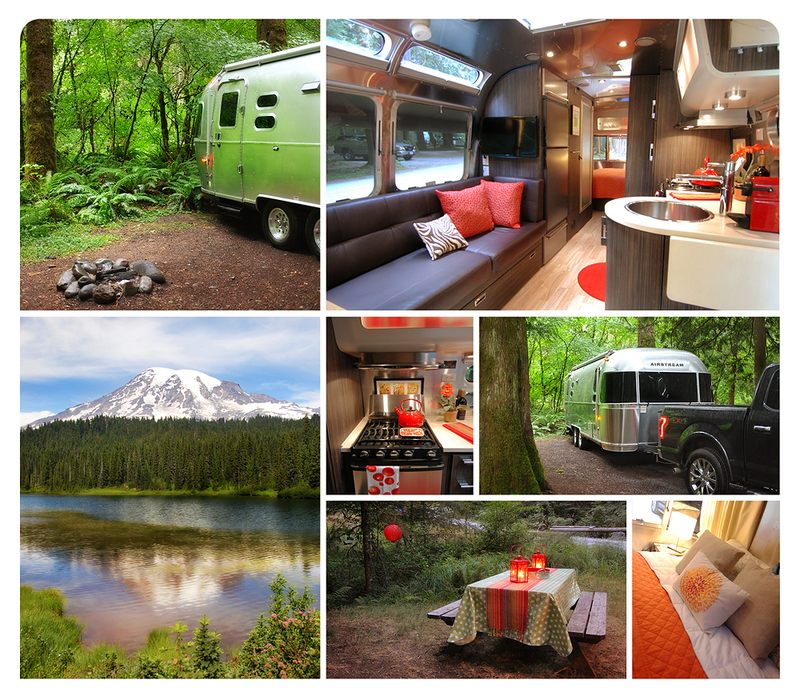 I am so in love with airstream. I was wondering if I can use one of your photos? I was looking for a way of contacting you privately but I can’t find any contact info for you. I’m thrilled to find your inspiring blog. My partner and I lived in Portland for many years..now in Camas. We are looking to buy next year and start our weekend adventures. I’m looking forward to learning from ya’ll some cool spots! Thanks for sharing.